A few posts ago I wrote about how my boys are the reason I push forward with my writing. And that is still very true. But it’s also true that, lovable though they are, they don’t leave me much time. Whether you’re trying to write or not, if you’re a momma you know, kiddos keep you BUSY. And they tend to turn what used to be a 45 minute task into an entire morning ordeal. Well, I have a solution…to at least one of your problems. Last week I was introduced to #clicklist @mysmithsgorcery. And, after using it twice, I can tell you decisively: I am IN LOVE! I placed my first order while watching netflix on my couch. After that, all I had to do was show up during the pick-up time I selected. The groceries were brought to my car by two friendly workers and I headed home without having to lift a finger or unbuckle a kiddo. Not only did they call me to make sure they understood my meat order correctly, they also brought a flower and piece of chocolate to my car. (it was Mother’s Day) The chocolate, of course, was gone 3 seconds after I snapped a pic. AND when I came a second time with all my children in tow (one of whom was very tired – read cranky-) they rescued me with complimentary fruit and water! Ok, so I know some of you have your groceries planned out way in advance, but honestly, I”m lucky if I remember to get fully dressed most days. SO being able to place an order and pick it up a few hours later is amazing for me! Picking the right fruits and veggies is a challenge for me. For one thing, I don’t know what I’m doing. For another, even if I did, there’s no way my children are going to stay in one place as I dig through avocados. Smith’s gives all their pickers extensive produce training. You can ask for ripe fruit, green fruit, some of each. Just add it in the special requests and they’ll get it done. And unlike me, they actually know what a ripe avocado looks like! 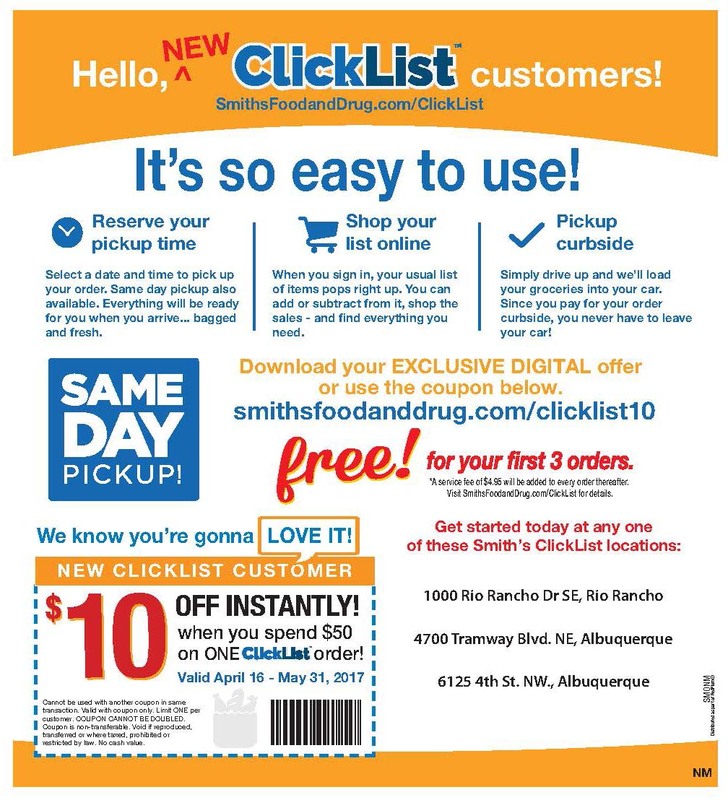 SO if you’re a mom, dad, human being, download the Smith’s app or go to your computer and try out #clicklist. They wave the 4.95 fee your first three orders AND click here and you’ll get $10 off when you spend $50! Not in ALbuquerque? Check out smithsfoodanddrug.com/onlineshopping to find a location near you!